Live in the area? 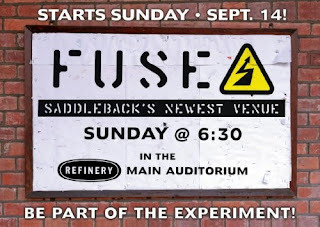 If so and you want to check out a great new church experience come join us on Sunday nights! Okay, all I can say as we head into the next 60-something days of presidential campaign craziness is WOW. - Democrats have fresh, young, African-American rock star caliber presidential candidate with little experience but lots of great ideas partnered with steady, seasoned DC insider. - Republicans have steady, seasoned DC insider presidential candidate partnered with a fresh, young woman with little experience. Not sure if she's a rock star, but she's no dud. - History will be made either way, which I think is an awesome thing. I'm so excited that my kids will have a black president or a female vice president. Really, it's about time. I'm not sure I've seen a riskier move than McCain's choice for V.P. Talk about swinging for the fence! The biggest downside to me would be that if it backfires and McCain gets beat in a landslide, much of the blame will be put on Palin and that just sets things back again for women, which would be a drag. But Obama in the white house ain't a terrible historic statement either so that's a trade-off, I suppose. The next two months promise to be interesting. It's been a crazy week in the Johnston family mainly because we are getting ready for our daughter to enter her freshman year of high school. She has spent her entire life in a much smaller christian school and is now heading into a public high school with a freshman class of around 700 students. Yesterday was the freshman "link" which consisted of four hours worth of meeting upper classmen, being introduced to administrators, going on a scavenger hunt to get familiar with the campus and more. Today was "round up" which was a one hour forms frenzy to make sure everything is in order for the year. It is an exciting time. It's also an anxious time....for her and for us. The best part, though is that her impending move from a small, safe, christian school to a large public high school has cracked open the door for some great conversations. With high school on my mind, I stumbled across two books that grabbed my attention. Neither of them are new, but neither of them really jumped out at me until recently. "The Price of Privilege" and "Doing School" both look like important reads. Feel free to recommend a book that should be higher on my "must read" list. A Team or A Work Group? I think I may need to go on the record (whatever 'the record' is...) as saying that the term "team" has become overused and virtually meaningless in most ministry settings. Just because you work with a group of people doesn't make you a team; it probably just makes you a work group. As the leader of a ministry, I really do want the group of people I lead to be a team, but it doesn't happen just because I want it to. I think in order to function like a team instead of just a work group, you need to identify what defines a team and then constantly work toward that goal. - The end result or product is most important. - People are specialists and never contribute beyond their specialty. - Usually has highly defined and highly functional chain of command. - Trust, camaraderie, liking each other etc. aren't crucial for success. - The people and the journey is just as important as the end result or product. - People may have specialties, but contribute in other areas to help the team when needed. - Much more "fluid" chain of command. The person "in charge" may change from project to project or moment to moment depending on the situation at hand. - Trust, camaraderie, liking each other etc. are vital for long-term success. I have absolutely NO problem with work groups....In fact work groups may be more effective at, well at getting work done! I'm just suggesting that we not diminish what a real team setting looks like by calling every group of people one. - This weekend marked the end of our 10-week summer series, Full Service Summer. We wrapped it up with a lesson on using our past to help us navigate our future using the rear view mirror as our object lesson. Over all, I think it was one of our best Summer series in a real long time. Momentum stayed high and each lesson stood alone which kept a long series from feeling too long. - Closing ceremonies of the Olympics, however, did feel too long...about 2 hours too long. The Olympics are over; blow out the torch and be done already...of course my wife was glued to the television through the whole ordeal. - Taking Cole and his buddy to Six Flags Magic Mountain today. Should be fun despite the fact that it should be over 100 degrees. - Don Cheadle is one of my favorite actors and the other day I was thinking that he was past due for a new movie. Last night (during the painfully long closing ceremonies) I saw a trailer for his new movie, Traitor, that opens THIS Wednesday! How is it that I've heard nothing about this? I've recently agreed to quickly write a short little book called "99 Thoughts About Guys...For Girls Eyes Only". It's meant to be written FOR girls ABOUT guys. The book will be pocket-sized and a quick read. When a guy says he loves you, he really doesn't understand what he's saying! He may really, really like you, but he probably doesn't really, truly love you. Mainly because he's still trying to figure out what real love is all about. Plus, sometimes guys say things they think they are supposed to say. Got one? I could use a little help. When I was in junior high, the radio station I listened to (Kmet which played the current Rock and Roll favorites....AC/DC, Black Sabbath, Queen, Van Halen etc.) always referred to Wednesday as hump day and I always giggled when I heard that term. The reference was that once your work week made it over the hump, you were on your way to the weekend and better times! Today is the first day in a long, long time I can remember hoping that the week would hurry up and end so that better times could ensue. It's just been one of those wacky, conflict-filled, problem-solving, "I can't get ahead of the game" kinds of weeks. Weeks I'm sure none of you can relate to! Anyway, in honor of "hump day" and Kmet, I am listening to the sweet sounds coming from the classic rock playlist on my iPod. Better times are on the way! I don't know how to embed a JibJab video, so here's the link to a fun one about the campaign that wraps up with a quick bit about Saturday's Civil Forum. Obama riding a unicorn may be the funniest humor bit of the campaign season so far. Don't know much about the details, but Youth Specialties is looking for a couple to go on a 5-month road trip project! Read more about it here. Send In A Game And Get $100.00 In Downloads! - Include a title for the game, a brief supplies/cost list, an "objective of the game" that summarizes it and a clear, easy to understand explanation. - Games need to be games that can be played indoors and can be group games, mixers, team challenges, individual physical challenges, etc. - Submit your game to Nadim at Nadim@simplyyouthministry.com by Friday, September 19th and be sure to include contact information so you can be notified if your game is used. Our junior high team is away for a 24 fall planning retreat. Fine-tuning and clarifying roles, planning the fall calendar of events and teaching topics, and creative brainstorming are all part of our schedule. So far we have talked about what real teamwork looks like, added a few really exciting events and activities, made a little tweak to our small group schedule and eliminated a highly successful sacred cow (after at least an hour of seriously passionate conversation and debate). We have three hours together this morning to finish the tasks at hand. In my opinion, this fall is shaping up to be fairly different than any in the past but quite a bit more exciting, too. - Internships: What makes them a win/win (a win for intern and the ministry)? - Internships: Do they have to be two years long to be effective? - Olympics: Crazy how a communist country ripe with human rights violations can look so appealing on television and under a certain spotlight. - Starbucks: Why am I here instead of Peete's? - Communicating to teenagers: Is it as important part of a youth ministry program as we think it is? - Youth Pastors: What are the top 3 or 4 qualities of a truly effective one...one that can be successful in any size church and setting? - Student Leadership programs: Ugg! So important, but are they really? Do they ever accomplish what we hope they will? - Coffee: Why does it result in such bad breath? - Public restrooms: Even though they all have that little chart that shows who cleaned it and how often...they are usually nasty. - Leadership: So many books, and 'irrefutable laws', but certainly there are a handful of non-negotiables? Just saw this interesting list of the 10 worst gadgets of all time. Fun, little piece, but I would have LOVED if it included some list of what these products ultimately led to. My hunch is that some of them, though huge flops, were actually the predecessors to some pretty sweet stuff. Can you think of a time a significant ministry "flop" turned out to be a springboard for something really great? Great New Junior High Resources! If I remember correctly, Youth Specialties has been publishing Talksheets since somewhere around the mid 80's. If you are looking for a GREAT way to get your middle schoolers talking about and engaged in your lesson, it's tough to beat Talksheets. The newest edition by Terry Linhart focuses on the life of Jesus. This six-book series comes to a close with the final two books written by Mark Ostreicher and Scott Rubin. Now that the series is complete, I'm hoping they package them in a cool "box set" parents can give their junior highers. This book is about a year old, but somehow I just stumbled upon it and....WOW! Full of one-page insights into how to minister and respond to issues of grief, divorce, gender identity, addictions and more. On Group's site, it looks like maybe this is only available as a download, but I'm sure there is a way to get hard copy if you'd like. This is a book I would put in the hands of every volunteer in your ministry. - Taking my soon-to-be freshmen daughter to her new high school to meet with counselor to discuss class schedule etc. - Spending about an hour outdoors today cleaning my side yard. It's going to take about 3 hours in my air-conditioned house to recover. - Talking to my neighbor who recently suffered a stroke and had heart surgery...he's only about 10 years older than me. - Grumbling under my breath as my son decided to trade a bunch of his video games etc. in at Game Stop to get a PSP. His other stuff is perfectly good and they don't fetch much value in trade-in (I hear my dad's voice in my head as i type!). - Talking to a guy who is about to run a half marathon and realizing I couldn't even run a 1/10th marathon! I'm on a short vacation to Palm Springs so not thinking too much about anything very blog-worthy. - Week 7 of our Summer Series "Full Service Summer" was smooth. Each summer we do a 10-week series and, depending on the series we pick, it can either be incredible or start to feel way, way too long. This summer has been really good. I think the key to long series is to have some sort of "umbrella" theme but let each lesson stand on it's own...trying to build off of each lesson for too long is where we seem to run into problems. - Saw Wal-E last night and was pleasantly surprised. Such limited dialogue made good story telling a must. - The first part of our vacation is exactly the kind I like: Lazy, nice hotel, swimming, movies, sleeping in (although I have a hard time doing that), eating out, reading...just being lazy. The highlight today will be the super fancy all-you-can-eat breakfast buffet. - The second part of our vacation will entail a bunch of chores and projects around the house. Cleaning the side yard, pulling weeds, cleaning up planters, working on dirt bikes to get ready for riding season. Not nearly as fun or lazy as part one. Kyle Loza, a GREAT young man who grew up in our youth ministry (he broke his ankle at junior high camp bombing a massive hill on a dirt board), won the gold medal at X-games for best trick in freestyle MotoX for the second year in a row. If you haven't seen this you'll need to watch it a few times to comprehend.